I am so happy that you posted this. 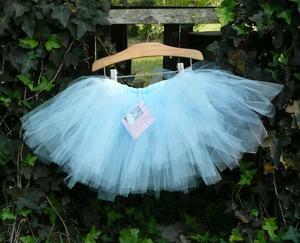 My daughter's 1st birthday is coming up & I wanted her to wear a tutu, but don't want to spend a fortune on one. Plus, it would mean more if her mommy made it for her. I am so excited to get started. 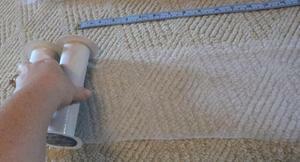 Just a couple questions: Where do you find tulle in rolls? 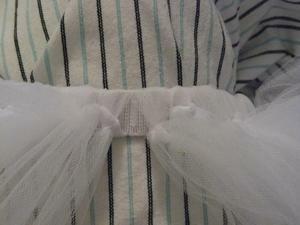 Also, how did you add the ribbons to the tutu that the little girl is wearing in the picture? It is sooo.... cute!! Well, thanks again and if you have any tips, please do share. 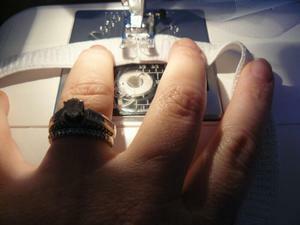 I'm not very crafty, but will hopefully be able to pull this off. Thank you so much for this. 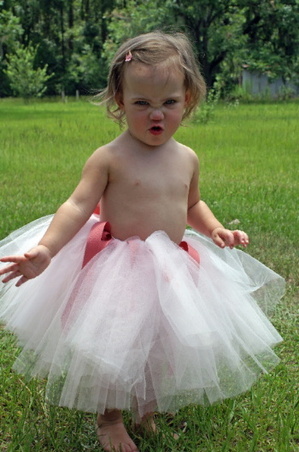 I cant wait to get started making my nieces each a tutu. oooh this is soooo cute! I found your tutorial by way of Craftster...thanks a bundle! My 7 week old baby girlie is GONNA BE A BALLERINA!!!!!! just had to come back and tell you I made the tutu...I put the url to my blog where I have the photo posted along with a link to your tutorial. I'll post on your flckr when I get a better photo. thanks again! I'm gonna make some for my nieces, next! Thank you so much for posting this tutorial! I just finished making a red tutu with ribbons and ladybug buttons on it for my daughter for her ladybug halloween costume, and it was so easy! 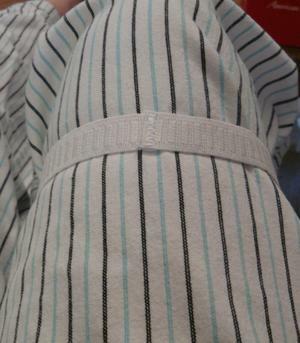 I cheated even more by using a big hairband (the Goody Ouchless ones that look like headbands but are elastic and go all the way around) - this alleviates the problem someone asked about earlier, with the curling up of the elastic, because the band is narrow and cylindrical. Thanks again! I'll post a picture of it, if you'd like! Your tutu's are adorable. As soon as I saw how easy this looked I went out and bought the tulle. 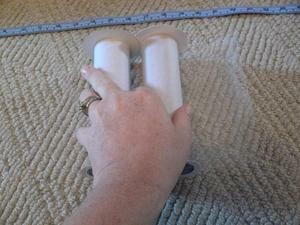 My local fabric store didn't have the six inch rolls so I bought it on the bolt and cut it down. I made the whole thing last night, in under an hours time (even with all the cutting). It turned out great!! My little princess is going to be 3 in a few weeks so I made it for a gift for her, I can't wait to give it to her!! I'll post a pic soon!! Thanks for the great tutorial!! Thank you for posting this tutorial! 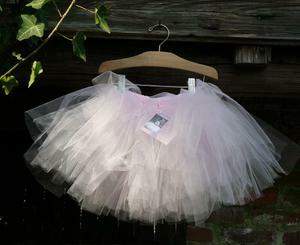 My one year-old daughter is going to be a ballerina for Halloween! It turned out so cute. Too cute! 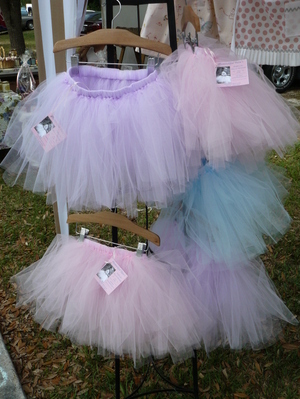 Looks like my neices will get a tutu for Christmas! Thanks! Oh. My. Goodness. I'm so freaking excited to do this for my daughter. You have made my day, and I'm sure hers as well. Thank you for this! I teach a dance class and had no idea how to make tutu until this! Thank you for this!!! I have to say you are so right...There is no reason in complaining when you get a bunch of orders all of a sudden...lol. I just started making them and gave my first one as a gift on Friday and by Saturday I had 6 orders!!! Plus my little girl is in love with hers!!! 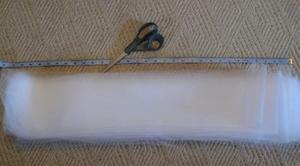 Oh Goodness This Really Helped Me, I Just Finished My First Skirt For My 4 Yr Old And It Only Took Me Around 45 Min It Was So Easy. Thank You So Much!!!!!! Thanks so much for taking the time to make a tutorial and share it!! I was thinking of family pics and thought how adorable to have my baby in a tutu! Thanks again. This was genius! I think I can handle it...one 1st Birthday Tutu coming right up! omg - love the tutorial! can't wait to play with this idea in adult sizes. Great tutorial!! I'm getting ready to make one for my daughter for an Easter gift. She'll be so excited. 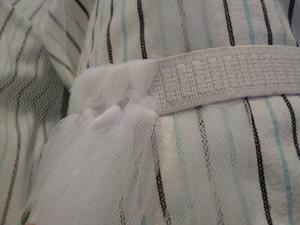 I bought some ribbon as well and I'm hoping to do light pink and purple ribbons in between the tulle. Can't wait to see how it turns out! !